I was able to finish up the drive for the vertical movement. The motor pulls the trolley up via a pulley. Movement up is very slow and I had to PWM the the downward travel to even things out. I definitely need to get a better motor if I manage to get decent scans with this rig. The first worm gear was too rough, I had printed it at .3mm. The new one is printed at .1mm and that makes a big difference in noise and motion. I had to run a pulley at the top to double up the line and roughly halve the load on the motor. 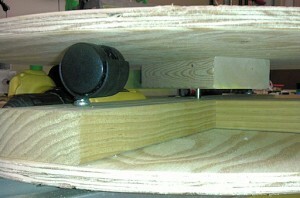 Still printing off the end-stop mounts but here’s a shot of where I am on the drive mechanics. 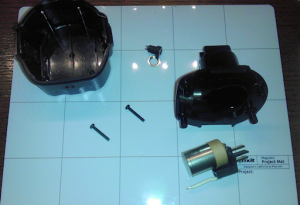 Received some parts from Digi-Key to assemble the motor controller for vertical drive that will move the camera. The controller is basically a relay that has the two outputs crossed so that when the relay goes from Open to Closed the output polarity is reversed. Two darlington transistors allow control the direction and turn the motor on/off via the Arduino. 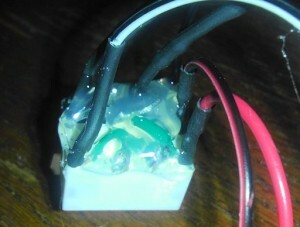 I pulled the info from Instructables. One thing I didn’t check before I heated up the iron was the schematic for the relay. Apparently mine was a little different and I had to do a little rework to get it right. 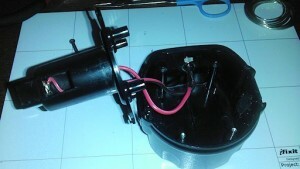 The motor was pulled from a DVD player/VCR combo that says “Loading Motor” on the PCB. I’ve been running it at around 9V and it is too fast. I’ll have to implement PWM to get the speed under control. I tried a 10k ohm variable resistor but that is too touchy to get the right speed. I have a worm gear printed off and I need to design a mount for the gear, motor, and spool. Looks like I’ll be busy for a few more days on this. I’ll be using an Arduino UNO to set up the motors on a 1.1 minute cycle to correspond to the max time Skanect runs a scan. The turntable will simply rotate for the duration. The Kinect scanner will begin at center then rise until the endstop is activated then reverse direction to the bottom until the endstop is again activated. Ideally the turntable and scanner will return to their starting position to minimize any manual resetting of the gear between scans. The initial arduino code is below. No timer has been implemented as of yet. This is working on the breadboard and I’m slowly adding the external motor control circuitry. const unsigned int DEBOUNCE_TIME = 500; // Using 500 to ensure endstop has time to disengage after dir change. long startTime = 0; // time the cycle began. pinMode(dirPin, OUTPUT); // Used to control motor direction. The Battery pack has been replaced and wired to accept a 5.5mm jack. Without the batteries holding the top connector in place, I insulated the connections with tape and then pressed paper filler into the cavity behind the connector. 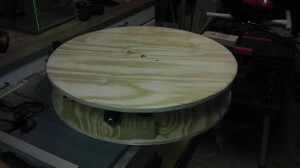 The turntable came together in a few hours. I still need to develop a drive system. 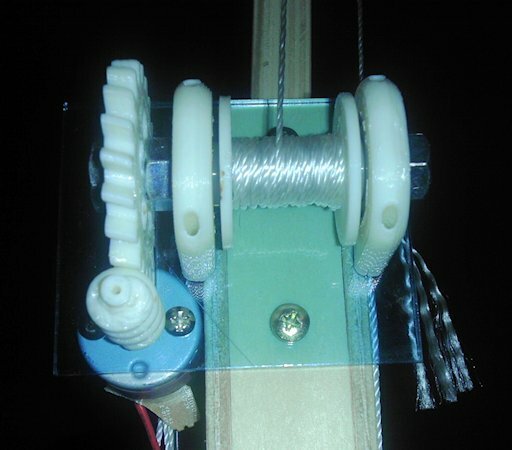 I am thinking about using an old gear from a “Wade’s Geared Extruder” thing. 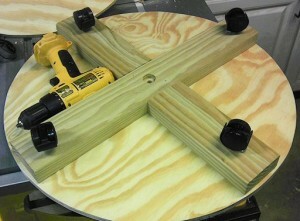 I’ll have to design a track to run the perimeter of the turntable for the gear to turn and hold the top. Here’s some shots of my progress so far. The table is 23.5 inches in diameter in 3/4 inch plywood. The chair caster wheels will support the weight of the average person. A 5/16″ bolt through the top and into the base with a 608 skate bearing holds the top disk on center. The top was flexing a little bit so I may double up the thickness later if it becomes a problem. I have an old 9.6V Dewalt drill with dead batteries. This will make a perfect drive motor as the clutch will prevent the platform from turning when turned off and the motor has variable speed. The only challenge will be to figure out the drive train. But first I need to convert the drill to run off power. I could just buy another battery but that in itself would cost over $40 and my goal is to spend as little as possible. Also I believe I can control the speed via PWM by using a MOSFET driver and a DC Adapter. With the battery pack disassembled, I’ve installed a 5.5mm jack to match the 9.5 volt adapter. When I get a bug, I just can’t stop. I’ve been trying to do a full body scan with Skanect and ReconstructMe but I just can’t get good results by freehanding. And I can’t scan myself by hand. So I’ve decided to try building a rig similar to OpenSkan. It would be great if the OpenSkan project was actually open as in open source but other than a general description and demo video, I haven’t been able to locate any kind of build instructions so I will be documenting my own build here. I spent the last couple days carving out a platform from low grade plywood, developing software for the arduino UNO, and assembling some electronics. I am not trying to build the best scanner, just the best I can with what I already have laying around my workshop. 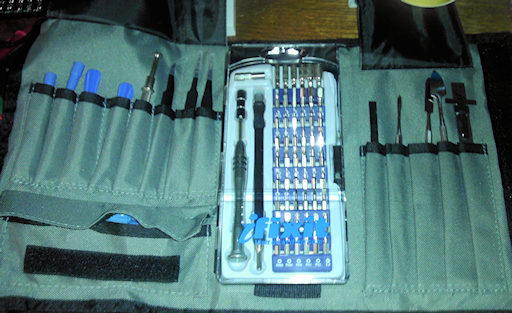 Also, I received my toolkit and mat today. I am impressed with the quality and compact packaging. This is the perfect kit for working on the smaller scale electronics. I could have used this when I replaced the screen on my cell phone.